At Metromile, we believe that car insurance should never be a hassle. We even go the extra mile to make car ownership simple and seamless, with an app that has helpful features like street sweeping alerts and a car locator. Now, we are introducing a totally redesigned dashboard that makes it easier than ever to access the information you care about the most. Get a quick snapshot of your balance and trips. If you are currently a Metromile customer, just log-in and your new dashboard will be waiting for you. At first glance, you’ll see your current balance, miles driven and overview of miles per day. If you have a bill that is due, you’ll also see that information, as well as a button that allows you to pay with one click. It’s never fun to pay bills, so we wanted to make it as painless as possible! Scroll down and you can view your car’s location and recent trips. If you have multiple cars on your policy, you will see information broken down by vehicle. Want to get more detailed? 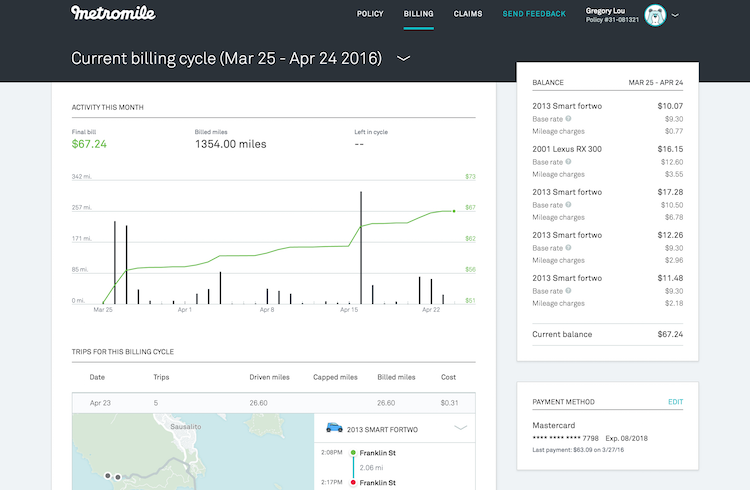 Head to the new “billing” section, where you will see a graph that correlates daily mileage with your bill. You’ll also see a list of the trips you’ve taken in your billing cycle. Click on a date and an interactive map will appear, giving a visual snapshot of a day’s worth of driving. 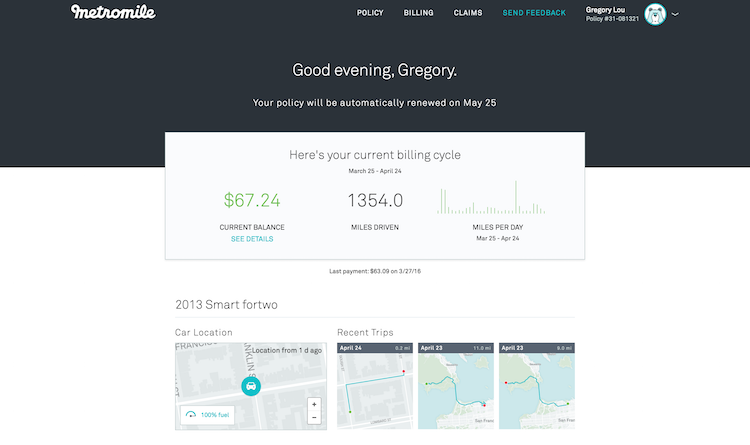 Again, if you have multiple vehicles on your policy, you can easily toggle between them to view detailed information for each. Now, you can see how each trip affects how much you pay. You might even be inspired to make adjustments to your commute to save more money! 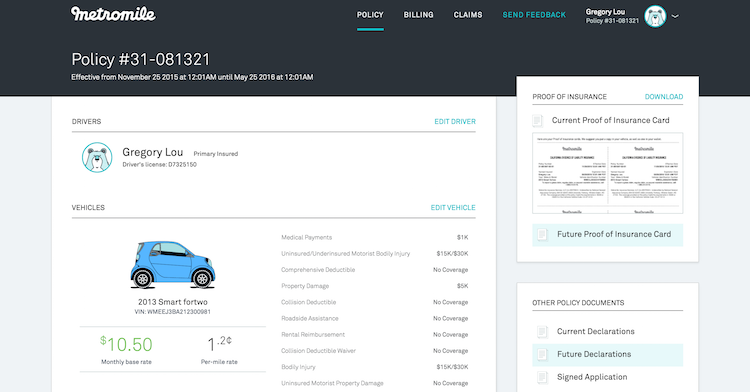 In the “policy” section, you’ll see an overview of all of your insurance information. This has everything you could ever want to know about your policy and is also where you can access policy documents and your proof of insurance card. We wanted to add some fun to typically stagnant insurance information, so you’ll see a customizable avatar and illustration of your car (you can even pick the color). The best part is that we’re only getting started. We have a lot of exciting updates in the coming months, so if you aren’t yet a Metromile customer, make sure to get a quote now so you can take advantage of everything we have in store!